This is a lovely medium-sized to large evergreen tree with a smooth greyish-white single stem on young trees and beautiful purplish-red young leaves. This handsome tree is grown in gardens for its deep shade. Syzygium guineense is a medium-sized to large evergreen tree and usually grows up to 15-20m high. 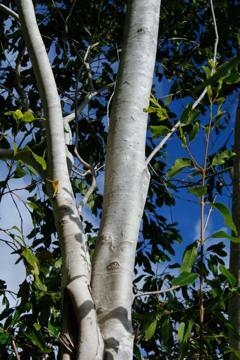 The bark is smooth and greyish-white to grey-brown in young trees, turning rough, flaky, creamy, light grey, dark brown or black in older trees. The leaves are 50-175 mm long and 15-75 mm wide, simple, opposite, elliptic to lanceolate with smooth margins which are sometimes slightly wavy and rolled downwards; older leaves are yellowish-green to glossy dark green on the upper surface and rather paler green and dull underneath; they are slightly fragrant when crushed. The new foliage is a very attractive purplish-red. The woodland waterberry has creamy white flowers about 15 mm in diameter, with a sweet fragrance. They flower from August to December and fruit from December to April. 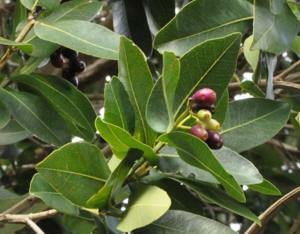 The edible fruits are usually dark purple when mature, with a single rounded seed. 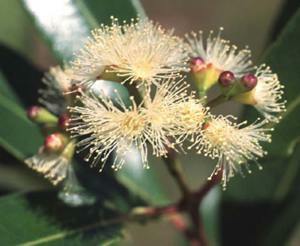 The conservation status of Syzygium guineense is of Least Concern; it is therefore not threatened in the wild. The woodland waterberry usually occurs in lowland forests, in areas close to swamps and sometimes along river banks. It usually grows in moist conditions and sometimes even in water. It prefers fresh, moist, well-drained soils with a high water table, but will also grow in open woodlands. It is widespread from northern KwaZulu-Natal through Swaziland, Mpumalanga, Limpopo to Mozambique, Zimbabwe, northern Botswana and northern Namibia towards central Africa. Syzygium is derived from the Greek word 'syzygos' , meaning 'paired' or 'couple', and this refers to the opposite or paired leaves and twigs. The specific name 'guineense' means 'of Guinea', the area where the tree was first collected. The common name 'water pear' refers to its preference for growing along river banks, and to its wood, which supposedly looks like that of a pear. The ripe fruits are edible for humans, birds, and some wild animals. An infusion of the roots is used in African medicine to bathe a patient if an illness has become serious. An infusion of bark and roots soaked in hot water is used as a purgative. 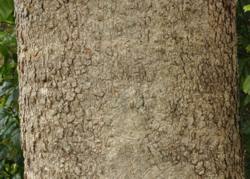 However, the bark can be toxic, and deaths from its use have been recorded. The wood is pale red, hard, strong, durable and easy to work. Syzygium guineense is easily propagated from seed. For successful germination, seeds need to be shown fresh, meaning that sowing must take place immediately after collection and cleaning. The seeds are recalcitrant and do not store very well. Fresh, cleaned seeds need no pre-treatment before sowing, and the germination rate is good, and uniform. Seeds are sown in a well-drained but moist growing medium, and they are sensitive to desiccation. It is best to sow seeds in autumn after collection. Coates Palgrave, M. 2002. Keith Coates Palgrave Trees of southern Africa, edn 3 . Struik, Cape Town .